What’s the biggest challenge artists face? 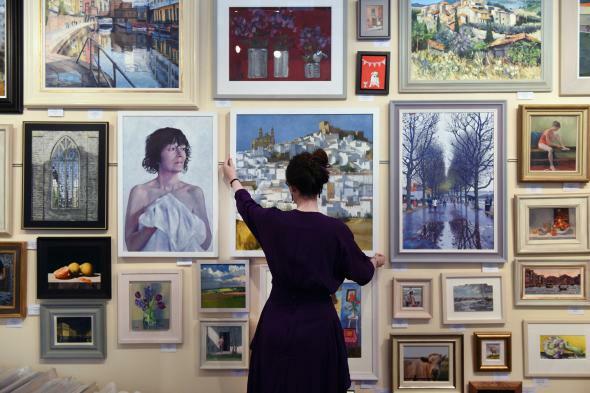 A gallery assistant straightens one of hundreds of original works of art that are displayed and sold in the “Not the Royal Academy” exhibition at the Llewellyn Alexander Gallery on June 9, 2015, in London. “Artists” is an immense category, as pointed out in this answer. I don’t believe anyone can answer this question for all artists, because there are so many different kinds, working at so many different kinds of art, at so many different levels. I can best speak to visual artists, and particularly those who create fine art. That is the field I know best. For these artists, I think the greatest challenge is the problem of being both artist and businessperson—but not because artists are not capable of doing business. They certainly are. This nonsense about artists not being up for business comes from many centuries of artists being infantilized and then exploited. It’s basically the same deal as men saying, “Oh, don’t worry your pretty little head, dear.” It’s crap. But there is a problem, and it’s a big one. If an artist is working deeply, she is going to a very profound place. And while there, she is incredibly vulnerable, undefended. She pulls her skin off and surrenders herself to the source of her art. It’s a very difficult and rather magical process she goes through from whence art—hopefully—comes. It is so much easier for any of us to cover up than it is for us to be vulnerable—especially to great depth, and in action—even when we have a discipline and a practice where we do it regularly. This is why artists have so much trouble wearing both of these hats—not because they can’t manage the roles, but because they cannot manage them simultaneously, and the productive cost of doing both is very high. This is also why, so often, a spouse or intimate partner ends up doing the business—which is also not a great idea, because it’s tough on the love relationship, but it eases the artistic burden. I think art schools need to develop a curriculum for art partners. This would be a business or marketing degree that would be a route for those who are not quite up to being professional artists but who still have a heart for art and could provide a serious solution to this dilemma while also helping artists move forward much more efficiently. Art market: Why don’t artists like the current art market? Selling art: I would like to do it for living, how do I start selling my art? Fine art: Should we learn to separate the art from the artist?